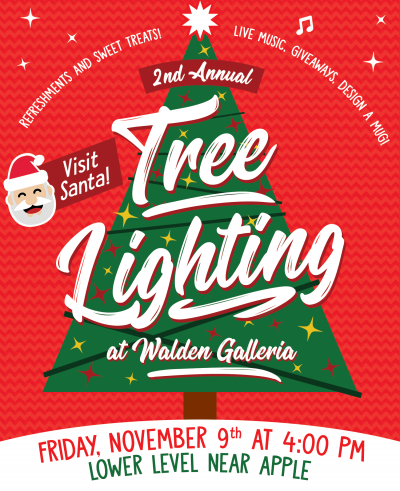 Join Walden Galleria on Friday, November 9th at 4:00 pm until 6:00 pm for the 2nd Annual Tree Lighting Ceremony on the lower level near Apple and Clarks. -Enjoy music from a holiday DJ with light refreshments from Tim Hortons & Mrs. Fields and design a holiday mug, while supplies last. -Bring a toy for Toys for Tots valuing $10 and receive $5 off specific packages. -Get your photo taken with Santa after he lights up the Christmas Tree with his holiday magic. -Wear an ugly Christmas sweater and have the chance to win a $100 Melting Pot gift card! Don’t miss out on the holiday fun!